Dozens of flights converged on Narita Airport on 31 July 1987 carrying hundreds of Japan Exchange and Teaching Program participants, many of whom had flown business class.1 Private buses whisked the new arrivals to the luxurious Keio Plaza Inter-Continental Hotel, where they were greeted, in the glare of the media spotlight, by the ministers of foreign affairs, education, and home affairs and the governor of Hyogo Prefecture.2 Following the official introductions, all the JET participants, as well as a host of current and former Japanese officials connected with the program, were treated to a gourmet dinner reception. The beer flowed nonstop, and an elegant buffet was served by kimono-clad hostesses. The Japanese speakers, by and large, expressed their expectation that the participants were to be "cultural ambassadors," indeed reformers of Japanese society. One noted, "It is my honest wish that through mixing with local people you will play your part as a stone in protecting the castle of peace." Another told the group, "You are participating in this great experiment. The process of internationalization is here to stay, and that is why you will be welcomed all over the country. . . . The understanding you can bring is so vitally needed in this turbulent world of today." Over the next four days of workshops on the nuts and bolts of teaching a foreign language or working in government offices, the theme of change was constantly in the air and a spirit of goodwill dominated. But by the end of August, when the JET participants had finally settled in local schools and communities, the positive atmosphere had begun to dissipate. For assistant language teachers (ALTs), life in Japanese secondary schools seemed focused on preparing for entrance exams to the neglect of spoken English. Some coordinators for international relations (CIRs) arrived in prefectural offices to find that the "coordinator" part of their title was something of a misnomer: their employers had little clue as to what they might do other than translate documents and teach English to prefectural employees. Prefectural conditions of employment varied greatly, and school visitation schedules seemed to promote superficiality. Negative reports about the JET Program began to surface in the national media, and questions were raised about the commitment of CLAIR and of the Ministry of Education to racial and gender equality and about the capacity of bureaucrats to provide the human touch. The first few years of the program were thus marked by numerous problems and misunderstandings as the reform-minded participants, most of whom spoke no Japanese and had little understanding of Japanese culture, vented their frustrations to anyone who would listen. These program-related complaints were directed primarily at the small cadre of Japanese officials and alumni of the Mombusho English Fellows Program and British English Teaching Scheme at CLAIR who had been assembled to administer the program. This chapter examines the administrative and cultural problems that arose during the first three years of the program from the vantage point of national-level officials. What issues were raised by JET participants and their brokers at CLAIR, the program coordinators? What were the major concerns on the part of Japanese officials at the Ministry of Education and at CLAIR? Most important, through what process were conflicts actually defused, and with what effect on each of the parties concerned? It is important to remember that the initial CLAIR staff numbered fewer than twenty and was anything but the stereotypical Japanese organization-a cohesive, tight-knit group. While the influence of the Ministry of Home Affairs was great, only three of the five ranking Japanese officials (yakuin) hailed from that ministry. As a group, the yakuin had only minimal experience with internationalization and were simply anxious to get through the start-up year without major problems. Most did not consider being posted to CLAIR as a step up in their career ambitions; instead, they usually viewed it as a lateral move, or even as removal from the career ladder entirely. In addition, there were eight staff members (uneiiin) representing local governments from as far away as Kumamoto Prefecture and as near as the Tokyo Metropolitan office. Though they were ostensibly appointed to CLAIR to acquire know-how for internationalization, these local government officials saw their stay primarily as a chance to develop ties with the central authorities that could later benefit their locality. Finally, there were three foreigners chosen as program coordinators for the pilot year: Philip, a soft-spoken American who had spent three years teaching in Saga Prefecture in the MEF Program and had married a Japanese woman; Caroline, an outspoken American who had spent two years in Chiba Prefecture in the MEF Program after graduating with a major in Japanese studies from a small midwestern liberal arts college; and Ben, a native of Britain and an alumnus of the BET Scheme. They would be responsible for designing all English-language materials for the program and handling most of the direct interaction with JET participants. Having worked hard to promote English language reform and cosmopolitan attitudes in their respective prefectures, they wereexcited about the great changes that the JET Program would make possible. The composition of CLAIR was thus even more complex than that of the agencies John Campbell has described as "pseudo-uchi"-agencies that cross ministerial jurisdictions in order to deal with recurring or permanent problems.3 There was no natural community of interest among the initial staff at CLAIR; on the contrary, the potential for fragmentation was tremendous. Yet this group with diverse interests quickly became focused on the shared task of managing an extremely complex and unwieldy program. 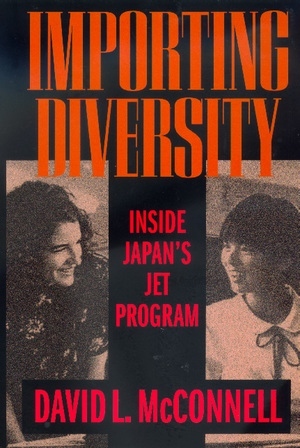 In 1987, the Japanese government inaugurated the Japan Exchange and Teaching (JET) program in response to global pressure to "internationalize" its society. This ambitious program has grown to be a major government operation, with an annual budget of $400 million (greater than the United States NEA and NEH combined) and more than six thousand foreign nationals employed each year in public schools all over Japan. How does a relatively homogeneous and insular society react when a buzzword is suddenly turned into a reality? How did the arrival of so many foreigners affect Japan's educational bureaucracy? How did the foreigners themselves feel upon discovering that English teaching was not the primary goal of the program? In this balanced study of the JET program, David L. McConnell draws on ten years of ethnographic research to explore the cultural and political dynamics of internationalization in Japan. Through vignettes and firsthand accounts, he highlights and interprets the misunderstandings of the early years of the program, traces the culture clashes at all levels of the bureaucracy, and speculates on what lessons the JET program holds for other multicultural initiatives. This fascinating book's jargon-free style and interdisciplinary approach will make it appealing to educators, policy analysts, students of Japan, and prospective and former JET participants. David L. McConnell is Associate Professor of Anthropology at The College of Wooster.